We just released an important feature: alerts via email. Now, you can automatically receive notifications daily, weekly, or monthly if there are new search results. The alert feature is free for everyone. 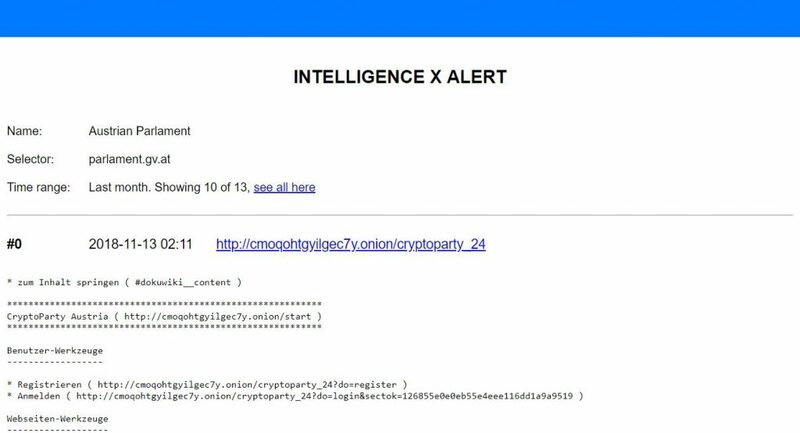 Sign up at https://intelx.io/signup and then go to the “Alert” tab under “Account”. Each search result is previewed with a maximum of 1000 characters. To see the full result you must click on the title of the result, which will then bring you to intelx.io. For each alert record, it will send a separate email if there are any results. If there are no results found, the system does not send an email. It shows a maximum of 10 results per alert. To see additional results (if there are any) you can click on the “see all here” link in the alert email. The alert system will use your user account to query the results, thus any restrictions your account may or may not have might influence the results you will receive. The system tries to deduplicate alerts. In some cases, such as darknet pages that are being re-indexed, a new alert might be sent in case a material change of the content is detected.